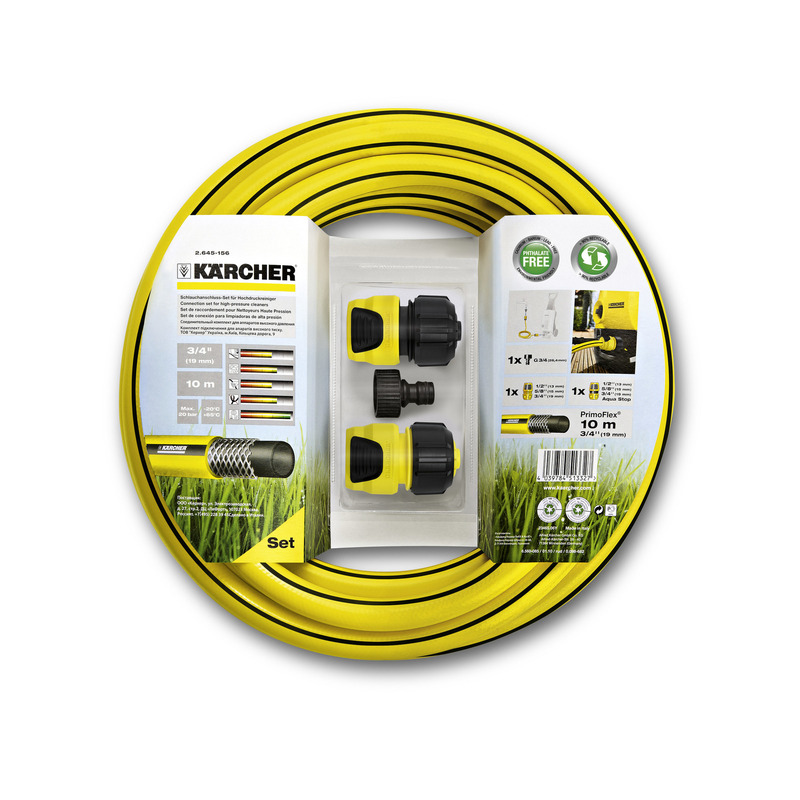 Connection Set for high-pressure cleaners 26451560 https://www.kaercher.com/uk/home-garden/watering-systems/hoses/connection-set-for-high-pressure-cleaners-26451560.html Hose set for high pressure cleaning or for watering the garden. With 10 m PrimoFlex®-hose (3/4"), G3/4-tap adapter, 1 x Universal hose connector as well as Universal hose connector with Aqua Stop. Connection Set for high-pressure cleaners is rated 4.6 out of 5 by 9. Rated 5 out of 5 by Sarah74 from does the job! very pleased with the hose and connection set. well-made kit, no leaking! Rated 5 out of 5 by DouglasJane from Fantatastic Machine For all of you that have scored this machine less than 5 stars you are not using it correctly. I have had 3 Karcher's and they have all been excellent. I am a big Karcher fan. OK once I had one arrive with a broken wheel but they swapped and everything fine. And that was down to the carrier more than anything. I clean the car, drains, patio, roof, walls, everything. Cannot live without it. Just get real and give it the score it deserves which is 5 stars and recommend, to friend 10.. Rated 5 out of 5 by RSG1 from K2 For the size of the machine it seriously packs a punch and is great for storage. Rated 5 out of 5 by Dave the rave from Karcher connection set for high-pressure cleaners Bought this to use with recently purchased Karcher 7. The pressure gauge was not working with my old hose. Works perfectly now. Rated 1 out of 5 by Not happy from Rubbish Hose kinked and unuseable. Customer services poor. Rated 5 out of 5 by Yunus from Best thing I bought, would definitely recommend to friends and family! Rated 5 out of 5 by Tommyc306 from Great service I bought this to go along with my high pressure washer and was delighted with the quality, price and speed of delivery. Well done. Rated 5 out of 5 by Bydand67 from Great Quality and easy to connect the fittings I bought this to go with my new Karcher pressure washer. great quality item with simple easy to use/connect fittings.